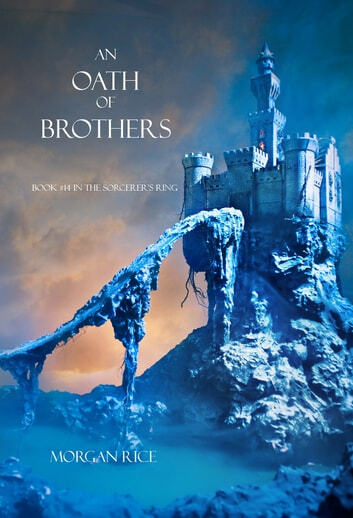 AN OATH OF BROTHERS is Book #14 in the Bestselling series THE SORCERER'S RING, which begins with A QUEST OF HEROES (book #1)—a free download on Kobo! In AN OATH OF BROTHERS, Thorgrin and his brothers emerge from the land of the dead, more driven than ever to find Guwayne, and set sail across a hostile sea, leading them to places beyond their wildest dreams. As they come ever-closer to finding Guwayne, they also encounter obstacles unlike ever before, obstacles which will test them to their very limits, which will call on all their training and force them to stand together as one, as brothers. Darius stands up to the Empire, boldly waging a guerilla war, amassing an army, as one freed slave village after the next rallies to his cause. Facing off against fortified cities, against an army a thousand times his size, he summons all of his instincts and courage, determined to survive, determined to win, to strive for freedom at any cost, even at the cost of his life. Gwendolyn, with no other choice, leads her people into the Great Waste, deeper into the Empire than anyone has ever journeyed, on a quest to find the legendary Second Ring—the last hope for the survival of her people, and the last hope for Darius. Yet along the way she will encounter horrific monsters, worse landscapes, and an insurrection from amidst her own people that even she may not be able to stop. Erec and Alistair sail for the Empire to save their people, and along the way stop at hidden islands, determined to raise an army—even if it means dealing with mercenaries of questionable repute. Godfrey finds himself deep inside the city of Volusia and deep in trouble as his plan goes from bad to worse. Imprisoned, set to be executed, finally, even he can see no way out. Volusia forges a pact with the darkest of sorcerers, and driven to even greater heights, she continues her ascent, conquering all who stand in her way. More powerful than ever, she will take her war all the way to the steps of the Empire Capital—until she is up against the entire Empire army, an army that dwarfs even her own, setting the stage for an epic battle. Will Thorgrin find Guwayne? Will Gwendolyn and her people survive? Will Godfrey escape? Will Erec and Alistair reach the Empire? Will Volusia become the next Empress? Will Darius lead his people to victory? With its sophisticated world-building and characterization, AN OATH OF BROTHERS is an epic tale of friends and lovers, of rivals and suitors, of knights and dragons, of intrigues and political machinations, of coming of age, of broken hearts, of deception, ambition and betrayal. It is a tale of honor and courage, of fate and destiny, of sorcery. It is a fantasy that brings us into a world we will never forget, and which will appeal to all ages and genders. Thank you Morgan these books are fantastic fantasy. I just finished reading book 14 "The Oath of Brothers" but you left me hanging I can't wait for the 15th book so when is it coming out. I found that these books as well as the Vampire ones that you wrote are so intriguing and suspenseful waiting to find out what is going to happen to them next. Loti and her brother Loc being sold by their mother wow that is just unforgivable. Thor and his legion brothers can't be dead or dying and poor Gwen walking and didn't even notice that she is alone with the baby. How many more books are with "The Sorcerer's Ring" so many questions but the answers are not coming in fast enough lol. Well hopefully they will be out soon. Well like the othe books in the series the keep you on the edge wanting more, it's so upsetting when your favorite weekly read ends. Good thing is depending where your at theres more to read or hopefully coming for those finished already.